If you’re not familiar with Baron watches, don’t be alarmed. They’re a fairly new company that specializes in offer “exquisite looks at an affordable price.” They’re largely right about that; the company makes interesting watches that offers some equally interesting features. Not only that, but they are quite affordable, too. 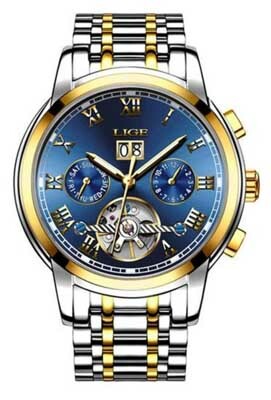 The company Website says that they’re based in the United States, but the watches are almost certainly made in China. The competition from China is quite fierce these days, as more and more companies that make watches are getting started there every day. Read on for the full Baron watches review. The build is good, though not exceptional. It’s certainly good enough, given their price point. Cases are made from brass and/or stainless steel. The watch face is protected by mineral crystal. All models are rated to at least 30 meters of water resistance, though some models are rated at 50 meters. Watches are sold with leather or rubber straps or stainless steel bracelets. The movements are both quartz electronic movements and automatic and manual mechanical movements, sourced from Japan. They seem to make about an equal number of both types. 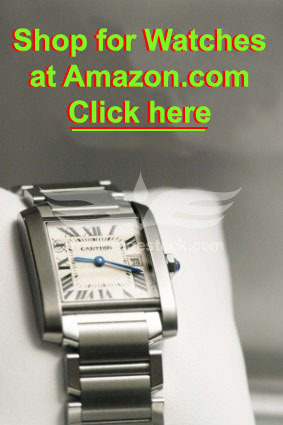 Click here to shop for Baron watches at Amazon. You won’t find a lot of cutting-edge innovation here, though the company does offer watches with a lot of features that have been developed elsewhere. 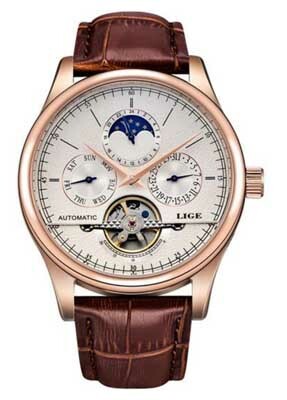 Models include models with such complications as second hands, chronographs, moon phases, dates and a couple of models even claim to have a tourbillon. We seriously doubt that they have an actual tourbillon, given their price point, but they certainly have something that looks like one. Styling is large and bold, with big cases in the 43-45mm range. All models of seem to be men’s models; we’re not aware of any models made by the company specifically for women. Several models of are rather unisex in style, so if a woman wanted to wear one and didn’t mind the larger case size, they’d certainly work well in that regard. There’s bit of color in the product line; most models have faces that are black or white, or dark blue, though there are also models with red and green faces, giving the buyer a bit of variety in their choice of color that we don’t often see. There are a few skeleton models, however, so if you like to see the moving parts that make the timepiece go, you’ll likely find more than one example from which to choose. 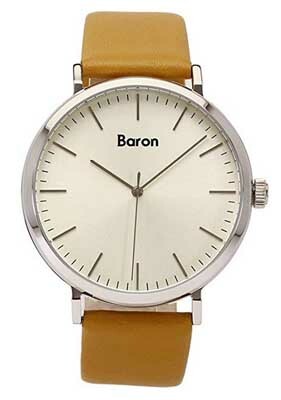 At present, Baron watches offers about 50 different models in their product line. Care and maintenance will be fairly simple. Many of their models have quartz electronic movements, which require little maintenance aside from replacing the battery every few years. Mechanical models may require service after a few years, but given their price point, we suspect most buyers won’t bother to spend the money to have them serviced or repaired. You should store Baron watches away from extremes of temperature or strong magnetic fields. With proper care, you’ll find that they’ll likely run well for a number of years to come. The warranty offered with the sale of Baron watches isn’t as good as most; the company warrants their watches for 12 months from the date of purchase against defects in materials and craftsmanship. Most watch companies offer longer warranties; the average is about 2 years. We have seen some online retailers who offer a longer warranty when you purchase there. Amazon is one example. You may wish to look into this if you’d feel more comfortable with a longer warranty. As designer watches go, you’ll find that the pricesare fairly reasonable. Prices range from a low of about $60 to a high of about $250 or so. That puts them at the lower end of the range for designer watches, though for those prices, you’re not going to find precious metals or gemstones. Unlike many watch manufacturers, this company does not restrict pricing among retailers, so you’ll find quite a bit of variance among retailers when it comes to price. You can buy them at a number of retailers online, though we aren’t aware of any brick and mortar retailers who stock the brand. We’ve also seen them for sale at the company Website. They’ll offer a good selection but they will not offer as good a warranty as you’ll find from other retailers, which might give you incentive to shop elsewhere. Not all retailers are going to have the full catalog in stock, but most online stores that carry the brand will likely have a good representative sample. One advantage of shopping online is that it will give you the best opportunity to buy discount Baron watches. When it comes to designer watches, you’ll find that prices, build quality, and features can vary dramatically. If you like a lot of features, you’ll usually have to pay a lot for that. If you want extraordinary build quality, you’ll likely have to pay a lot for that. Baron watches offer the opportunity to buy feature-rich timepieces that are reasonably well built at a fair price that most everyone can afford. There are some 50 different models, a variety of colors and styles, and both mechanical and quartz movements. What they lack are impressive water resistance (even the Marine Diver model is only rated to 50 meters) and any models at all for women. On the other hand, if you’re looking for a watch with dates, chronograph features, or phases of the moon at a price that isn’t going to force you to take out a loan, then Baron watches might be a good choice for you.